Store at -20 degree C (regular) or -80 degree C (long term). Avoid freeze / thaw cycles. Small volumes of anti-H3R26me2a antibody vial(s) may occasionally become entrapped in the seal of the product vial during shipment and storage. If necessary, briefly centrifuge the vial on a tabletop centrifuge to dislodge any liquid in the container`s cap. Certain products may require to ship with dry ice and additional dry ice fee may apply. Modulation of chromatin structure plays an important role in the regulation of transcription in eukaryotes. The nucleosome, made up of DNA wound around eight core histone proteins (two each of H2A, H2B, H3, and H4), is the primary building block of chromatin (1). The amino-terminal tails of core histones undergo various post-translational modifications, including acetylation, phosphorylation, methylation, and ubiquitination (2-5). These modifications occur in response to various stimuli and have a direct effect on the accessibility of chromatin to transcription factors and, therefore, gene expression (6). In most species, histone H2B is primarily acetylated at Lys5, 12, 15, and 20 (4,7). Histone H3 is primarily acetylated at Lys9, 14, 18, 23, 27, and 56. Acetylation of H3 at Lys9 appears to have a dominant role in histone deposition and chromatin assembly in some organisms (2,3). Phosphorylation at Ser10, Ser28, and Thr11 of histone H3 is tightly correlated with chromosome condensation during both mitosis and meiosis (8-10). Phosphorylation at Thr3 of histone H3 is highly conserved among many species and is catalyzed by the kinase haspin. Immunostaining with phospho-specific antibodies in mammalian cells reveals mitotic phosphorylation at Thr3 of H3 in prophase and its dephosphorylation during anaphase (11). 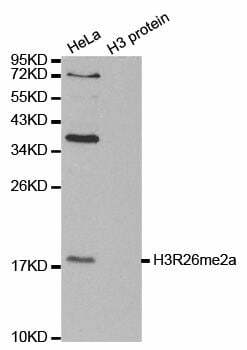 Western blot analysis of extracts of various cell lines, using Asymmetric DiMethyl-Histone H3-R26 antibody. Secondary antibody: HRP Goat Anti-Rabbit IgG (H+L) (MBS128200) at 1:10000 dilution. Blocking buffer: 3% nonfat dry milk in TBST. Immunofluorescence analysis of 293T cells using Asymmetric DiMethyl-Histone H3-R26 antibody. Blue: DAPI for nuclear staining. NCBI/Uniprot data below describe general gene information for H3R26me2a. It may not necessarily be applicable to this product. H3: Core component of nucleosome. Nucleosomes wrap and compact DNA into chromatin, limiting DNA accessibility to the cellular machineries which require DNA as a template. Histones thereby play a central role in transcription regulation, DNA repair, DNA replication and chromosomal stability. DNA accessibility is regulated via a complex set of post-translational modifications of histones, also called histone code, and nucleosome remodeling. The nucleosome is a histone octamer containing two molecules each of H2A, H2B, H3 and H4 assembled in one H3-H4 heterotetramer and two H2A-H2B heterodimers. The octamer wraps approximately 147 bp of DNA. Belongs to the histone H3 family.